Every now and then an error will occur at the most inopportune time; in this case it was in the design phase of the printed circuit board. Epoxy or mask needs to be applied to the conductor between the BGA pad and connecting plated hole or via. When circuit boards are in the proto-type phase, it is not uncommon for sockets to be used at BGA sites. Design Engineers must layout the BGA sites to meet the requirements of the selected test socket. Many of these sockets rely on a flat surface that precludes the use of solder mask. Eliminating solder mask is fine until it is time to move on with production when BGA components will be soldered directly eliminating the socket. You're probably not surprised that there is an occasional blunder at this point. In this case, someone neglected to re-layout the solder mask layer. Have you tried soldering a BGA component onto an unmasked BGA site? The primary purpose of solder mask at a BGA site is to isolate solder wetting to a specific area, the BGA pad. Solder mask is used to isolates the pad from the conductor, or from the circuit leading to a via or plated hole. Without the solder mask, the molten solder will bleed away onto the connecting pad, or into the attached vias. Solder joint opens and shorts are a guarantee. Two part epoxy is commonly used in place of solder mask. Scrap, a major ouch to the pocketbook. Use the same socket that was used during the prototype phase. This is probably not a practical solution, but it can be pursued. BGA sockets tend to be expensive and the durability of the connection can be a concern. Rework the solder mask at the site. This can be accomplished in a few ways. The most common method is to manually apply the solder mask, or an equivalent high temperature epoxy, to the site. Prior to applying the mask the surface must also be thoroughly cleaned to eliminate any contaminates and optimize the adhesion of the mask to the surface. 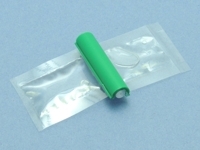 Inexpensive and disposable Micro Probes are ideal for dispensing a tiny drop of epoxy for mask rework. Complete coverage of the site is not always necessary, the key is creating the isolation barrier and this can sometimes be accomplished with a much smaller application of mask at the connecting circuit while leaving the adjacent area clear. This technique takes a steady hand, and the use of a variety of tools, including a controlled dispensing system, or fine tipped probes, along with tape or a template to shield the solder mask from reaching any undesired locations. This can be a tedious and time-consuming process, but is essential if you expect to place and reflow BGA component without headaches.